A collection of the global variables which should be set by a project to use the Tekkotsu framework. REQUIRED: you must define a behavior which will be started when the boot is complete. Displays information about an exception on serr, provides a default value for uncaughtException. Returns the index corresponding to a color of specified name by calling lookupColorIndexByName(). Returns the index corresponding to an rgb value by calling lookupColorIndexByRgb(). Returns rgb value corresponding to a color of specified name by calling lookupColorRGB(lookupColorIndexByName()). Returns rgb value corresponding to a color of specified name by calling lookupColorRGB(). Returns color name corresponding to specified color index by calling lookupColorName(). Returns color name corresponding to specified rgb value by calling lookupColorName(). Returns the number of colors, obtained from defSegmentedColorGenerator. 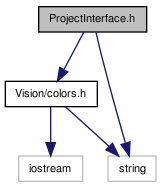 Defines ProjectInterface namespace - a collection of the global variables which should be set by a project to use the Tekkotsu framework.